Let our family serve your family dinner. Welcome to Jo’s American Bistro, a restaurant located in the heart of Newport, Rhode Island. Come for a casual yet classy dining experience, featuring original American cuisine, seafood, and numerous gluten-free options. We offer a selection from local Rhode Island producers and whenever possible, use natural meats with no hormones or antibiotics. Joann Carlson has spent her whole life in the restaurant business. Her passion for food can be traced back through her family’s roots. Her grandparents owned a fish packing company on the wharfs of downtown Newport and her family owned Dry Dock Seafood, one of Newport’s legendary Thames Street restaurants. When they closed the restaurant after 23 years, Joann co-owned and operated Percy’s Bistro. 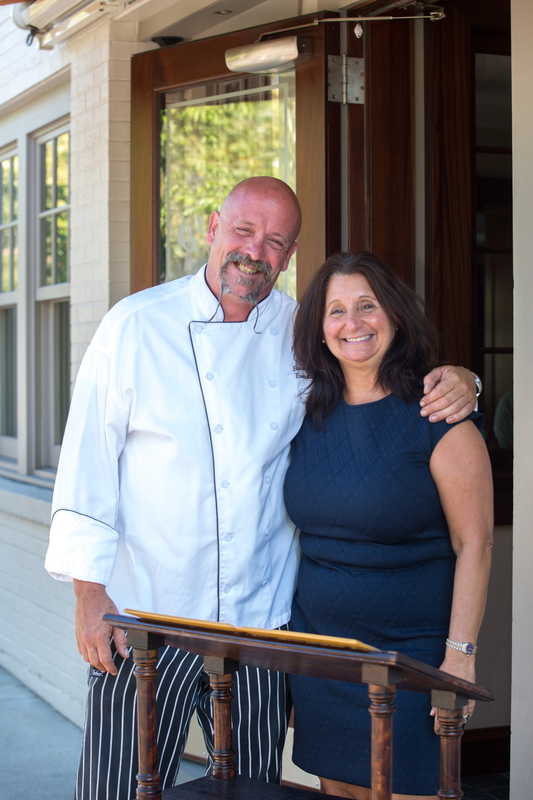 Prior to opening Jo’s American Bistro, Joann worked for Newport Harbor Corporation as a restaurant manager at 22 Bowen’s Wine Bar & Grille. Joann is as comfortable in the dining room as she is in the kitchen. Growing up with the restaurant as a family endeavor, she knows no other way to treat her staff and guests but as family. Visiting Jo’s American Bistro will seem as if you are sitting down to dinner in her home. And there is something to be said for having an Italian mother and grandmother to teach you how to cook and entertain with love and passion. Since graduating from the Culinary Institute of America in 1989, Chef Brian Ruffner has established himself as a remarkable creator of fresh American cuisine at several noted restaurants across New England. Peppercorn’s Grill in Hartford, Connecticut received an “excellent” rating from the New York Times with Chef Ruffner at the helm. While leading the culinary team at the Bay Voyage in Jamestown, Rhode Island Monthly recommended readers “drop everything and go.” Chef Ruffner was invited to participate in two James Beard dinners while working at the White Hart restaurant in Salisbury, Maryland. Ruffner was voted “Best New Chef” by Rhode Island Monthly in 2002. NEWPORT, R.I. — The beauty of the Newport dining scene is there are as many atmospheres as there are restaurants. Diners seeking virtually any style of food and service are well-served by the lively hospitality business. On Memorial Drive, there’s another new restaurant owner sharing her passion for all-American bistro food, plus a few Italian specialties, in a most stylish way. Joann Carlson is the Jo in Jo’s American Bistro. She took over the space that housed Puerini’s for years and turned it into two floors of dining space with different moods depending on where you sit. The first floor features a long community table and long bar that lend themselves to large parties and event dining. Upstairs are romantic dining tables, a bar with a stunning onyx feature wall, and a porch for outdoor seating. Just before she took on the building of a new place, Carlson worked for Newport Harbor Corporation as a restaurant manager at 22 Bowen’s Wine Bar & Grille, starting in 2006. She grew up in the business as her grandparents owned a fish packing company in Newport and her family owned Dry Dock Seafood on Thames. When they closed the restaurant after 23 years, Carlson, who grew up in Bristol, also co-owned Percy’s Bistro on Thames. The menu has bistro favorites including excellent Steak Frites with hormone-free beef, and Statler chicken. Seafood dishes include tender scallops, peppercorn-crusted tuna and lighter fare such as fish tacos and lobster rolls. Gluten free items are noted on the menu and chef Matthew Preble can adjust dishes as needed. Italian dishes include a Frutti di Mare seafood bowl, asparagus and ravioli and specials that might include a chicken piccata. A fixed-price dinner special is offered for $19.95 Sunday to Wednesday. It’s generally easier to park along Memorial Boulevard than in downtown Newport. Make a reservation now and see for yourself how our organic ingredients make Jo’s American Bistro superior in quality, taste and service! That’s all you need to know about Jo’s! All Rights Reserved © Copyright Jo's American Bistro 2018 | Website Proudly Powered by J. Arthur & Co.